Rock Formations Detail, Weston Beach, Point Lobos State Reserve, California, copyright 1949 by Philip Hyde. 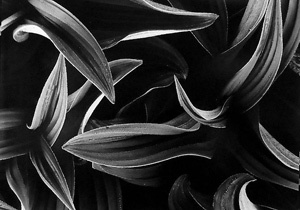 Many of Philip Hyde's early close-ups and landscape photographs showed the influence of Edward Weston. Edward Weston and Minor White may have been present when this original large format 5X7 black and white photograph was made. Widely published and exhibited with Group f.64. Planned to appear in the forthcoming book: "The Golden Decade: Photography at the California School of Fine Arts, 1945-55." In January 1946, the same year he began teaching at the California School of Fine Arts, now the San Francisco Art Institute, Minor White met Alfred Stieglitz and in December he met Edward Weston. Alfred Stieglitz had a profound effect on Minor White and his photography and other photographers impacted Minor White’s thinking, but the influence of Edward Weston became the greatest of all. As a member of Beaumont Newhall and Nancy Newhall’s social circle on the East Coast, that year Minor White also met Berenice Abbott, Harry Callahan, Edward Steichen, Paul Strand, Todd Webb, and Brett Weston. Then in July 1946, with the help of Beaumont and Nancy Newhall, Minor White accepted a teaching position on the West Coast under Ansel Adams at the California School of Fine Arts, now the San Francisco Art Institute in California. Minor White started by teaching the Summer Session as Ansel Adams’ assistant, but Ansel Adams recognized right away that Minor White had teaching talent and knowledge, besides he related to the students well. Within a few weeks, Ansel Adams left Minor White in charge and within a few months his job title changed to lead instructor. Arriving on the West Coast for the first time, Minor White moved from Princeton, New Jersey to a house owned by Ansel Adams at 129 24th Avenue in San Francisco, where Ansel Adams had his darkroom. Minor White would soon be as impacted by Edward Weston on the West Coast as he was by Alfred Stieglitz in New York City. Some of the parallels between Alfred Stieglitz and Minor White are more apparent than others. 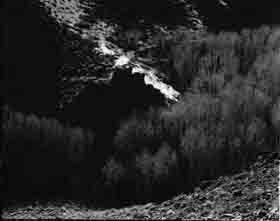 Much of White’s best work, both as a photographer and as an editor, came directly and consciously out of Stieglitz’s idea of the Equivalent, the photographic image as a metaphor, as an objective correlative for a particular feeling or state of being associated with something other than the ostensible subject. Each man in his day embodied and promulgated that controlling idea by editing journals of comparable impact, Stieglitz with Camera Work, White with Aperture. Just as Stieglitz and Edward Weston—the other principle influence on White—fairly dominated a significant portion of the photography world during the second quarter of the century, so White, along with Henri Cartier-Bresson, Ansel Adams and Robert Frank, dominated it during the third. Ideas play a role in the influence of Weston, Cartier-Bresson, Adams and Frank, but not nearly as important a role as they do with Stieglitz and White. Their work as teachers and editors has reached far fewer people than their photographs, and it has been less well understood, but both men’s lives testify in no uncertain way to the fact that it was every bit as important to them as their camera work. In December 1946, Minor White traveled south from his living quarters in one of Ansel Adams’ houses next to Ansel Adams’ darkroom near Baker Beach in San Francisco to Carmel and Point Lobos to meet Edward Weston for the first time. Edward Weston also lived in a cottage with his darkroom in Carmel Highlands on Wildcat Hill. 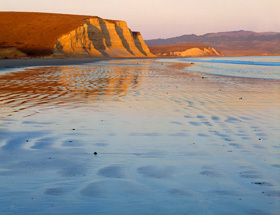 Peter C. Bunnell, in the biographical chronology accompanying the exhibition The Temptation of St. Anthony Is Mirrors, wrote that Minor White began “a profound attachment to the man, his ideals, and the place.” For the next few years Minor White took his students from the California School of Fine Arts, now the San Francisco Art Institute, on field trips to Point Lobos where they observed Edward Weston photographing with his large format view camera. The classes would then proceed to Edward Weston’s home on Wildcat Hill where they reviewed Edward Weston prints and student’s portfolios. This proved to be not only a personal, creative, and photographically significant milestone in his life, but it would also be of immense importance to the future of the school’s photography program and its students. Over the next couple of years, White and his students took numerous field trips to Point Lobos, where they met with Edward Weston. Edward Weston, who will have the most profound influence on White of any artist, develops a rapport with the younger photographer, and they meet many times before Weston’s death in 1958. Based on White’s deep admiration for Edward Weston and his work, Point Lobos will become for him a kind of quintessential photographic site, and it is in relation to his understanding of how Edward Weston gained his inspiration here that White will approach Point Lobos and other landscape sites for his own creative purposes. Minor White considered the pilgrimage to Point Lobos “the climax of every year,” so important that at one point he made the “generous proposal” to “forgo his own salary in favor of Mr. Weston.” He waxed that “on this trip the intensity rose like a thermometer held over a match flame.” He wanted to make sure that students had the opportunity “to study the working methods of artists” on the week-long trip with Weston “in his home territory.” Weston and the students roamed “over Point Lobos for an afternoon without cameras.” Only then would they photograph, while Weston would “climb around to each student and discuss what is on the ground glass.” They would sit on the rocks at Point Lobos, gathered around Edward Weston, “all trying to figure out what makes an artist tick.” After hiking and taking pictures, the students would drive to Carmel for dinner, then regroup at “Weston’s cottage to see the man and his photographs.” Weston “selected carefully, put them one at a time, on a spot-lighted easel. He talked quietly or not at all,…purred to his cats and kittens…He never belittled his work, never boasted, but let each picture speak for itself…And we looked. With the sound of the sea,…the smell of a log fire around, many of the seeds, planted during the year, sprouted.” White, as well as the California School of Fine Arts students, benefited from the trek to Carmel. 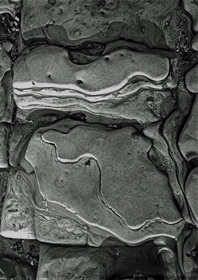 White was effusive about what he learned at Point Lobos in correspondence to Edward Weston. The students were familiar with Edward Weston by the time of the field trip to Carmel. His books were in the school library, his work talked about in classes, and one student, Ruth-Marion Baruch, had written Edward Weston: The Man, The Artist, and the Photograph as her master’s thesis while a student at Ohio University…the cachet of Edward Weston’s name on the roster of instructors would increase the schools profile. All of it arranged by Minor White and to his credit as lead instructor of Ansel Adam’s new photography program.